Power-line communication (PLC) is a communication protocol that uses electrical wiring to carry both data and AC electric power. It is also known as power-line telecommunications, power-line carrier, power-line digital subscriber line (PDSL), or power-line networking (PLN). Powerline communications eliminates the need for installations of network cabling, but the quality of the connection can be compromised and data rate is usually limited. Furthermore, connection interruptions can occur because of improper wiring and circuit breakers. The big benefits of using Power-line devices is to bring Internet to the access points if they cannot be connected with wires, as an alternative to mesh networks. 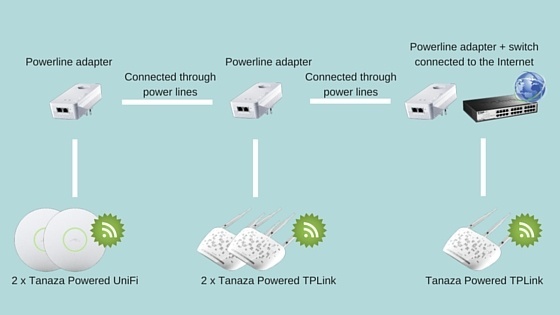 Powerline devices work well with the Tanaza access points. 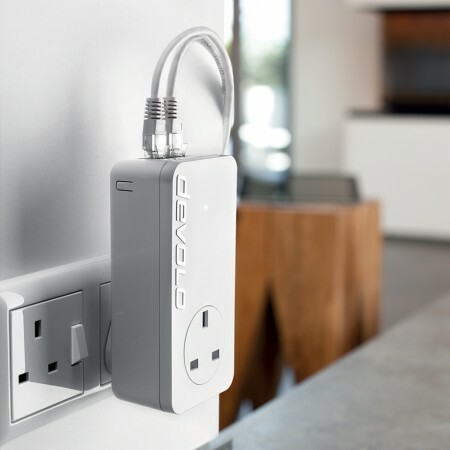 In the example, three Devolo dLAN 550 duo+ Powerline devices are installed in the same building (the Devolo dLAN 550 duo+ is a good entry-level adapter for your network) and are connected through power lines. Each Devolo has two LAN ports for connecting network-compatible devices like the Tanaza access points. With this configuration, the Tanaza Powered access points (TP-Link, Ubiquiti, D-Link, Mikrotik and many others) can be cloud managed through the Tanaza Cloud Dashboard – and they also have the full set of the Tanaza capabilities, including captive portal / responsive splash page, voucher-based authentication and social login. Another benefit of this configuration is that you can use multi-vendor devices in the same wireless network, broadcasting the same SSID and showing the same splash page to the WiFi clients. Otherwise, you can set up a mesh hotspot, but you would be forced to buy mesh access points from one vendor only (for example, Open-Mesh Access Points or MikroTik Mesh routers) without the flexibility guaranteed by a vendor-agnostic software.